Security experts suggest that you walk around your property and look for areas where someone could hide, such as behind tall shrubbery like a cedar hedge or behind a tool shed. Make sure these areas are well lit. 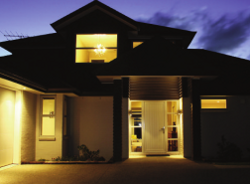 Home security experts also recommend that exterior lighting be installed with a timed dimmer. The lights can then be set to cast a bright light in the early evening, and then a dimmer light throughout the rest of the night.